Hello GRAND ISLAND motorists! 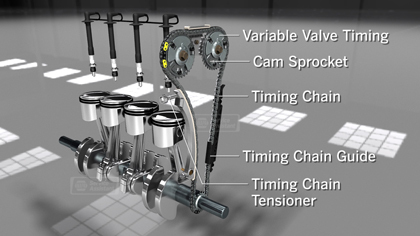 Todays Whitaker Auto Repair blog post focuses on the timing chain. As your engine runs, the intake valves need to open up to allow air into the engine. They remain closed while the air and fuel is compressed and ignited, powering the piston. Then the exhaust valves open to release the exhaust. This all has to be timed very precisely. It is the important job of the timing belt or timing chain to make sure all of this is synced up properly. Timing belts are made of a very tough compound that can last for tens of thousands of miles. Timing chains are made of metal and last for a very long time as well. If your sedan has a timing belt, your automobile manufacturer’s owner’s manual has a schedule for replacing the belt. If your vehicle has a timing chain, there may not be a specified schedule for replacing it, but that doesn’t mean that the timing chain system is indestructible and never needs attention. For example, the chain runs on sprockets on the crankshaft and the camshafts. A broken tooth on a sprocket can cause the chain to slip a little. When timing is off a little your engine will not run as smoothly. When timing is off enough your engine won’t run at all and could even be severely damaged. There is also a tensioner that keeps appropriate pressure on the timing chain. This keeps the chain tight while allowing it to absorb pulsations from the engine. The tensioner can wear out. There are also guide rails that keep the chain on the proper path that can become worn. The bottom line is that at some time, one or more of the timing chain system components will become worn to the point that they are no longer performing within specification. Your Whitaker Auto Repair service professional can help you with recommendations for when timing chain components should be replaced on your vehicle and inspect for signs of timing chain system wear. Since timing chains (and dozens of other parts) are lubricated by engine oil, smart GRAND ISLAND motorists stay on top of regular oil changes to prolong their life. Always elect a high quality oil filter and oil of the recommended type and grade. At Whitaker Auto Repair in GRAND ISLAND NEBRASKA (68803) we install quality NAPA replacement parts. Give us a call at 308.398.0505. To learn more about NAPA AutoCare, visit www.NAPAAutoCare.com. Let’s address a very important maintenance item for everyone in GRAND ISLAND NEBRASKA – timing belt replacement. It’s important because letting this one slide can lead to very expensive engine damage. All this happens thousands of times a minute and it’s your timing belt that makes sure the valves are opening and closing at precisely the right time. If the timing is off, your engine won’t run. And that’s the best case. Now, timing belts just wear out naturally so you want to replace a worn belt before it slips or breaks. Check your owner’s manual or with your service advisor at Whitaker Auto Repair in GRAND ISLAND NEBRASKA to see when they recommend you replace the timing belt. If you’ve never replaced your timing belt and have 60,000 or more miles on the clock, talk with your GRAND ISLAND service advisor at Whitaker Auto Repair right away to see if you’re due. On some engines, the water pump is driven by the timing belt as opposed to the serpentine belt. If that’s the case, it’s a good idea to replace the water pump when you’re replacing the timing belt, and vice versa since much of the same work has to be done for either. The same is true for the timing belt tensioner – it should be inspected and possibly replaced. Now, replacing a timing belt is one of the more expensive routine maintenance items on your service schedule. But not replacing your timing belt can lead to some of the most expensive repairs you’re likely to ever have. Copyright © 2011-2012 Whitaker Auto Repair.